Is there any site from where I can get Google Road network as shapefile? As per my knowledge It is not distributed by google. So anybody can suggest how can I create this road network for a custom use? Clearly, we need to approach OSM differently than just a free slippy map. The value of the data created is immense and we’ve tried to make it as easy as possible to bring that great data source into your GIS applications. When I think of OSM, I think of possibly the greatest mapping resource ever conceived. The depth and breath of OSM still amazes me, even after all these years of being involved with the project. WeoGeo hopes that by providing free and customizable options for using OSM, you’ll be able to not only use OSM data in your projects, but also give back to the OSM community. Clearly wise beyond my years, but it is time to stop using closed APIs such as Google’s or Apple’s and embrace OpenStreetMap. 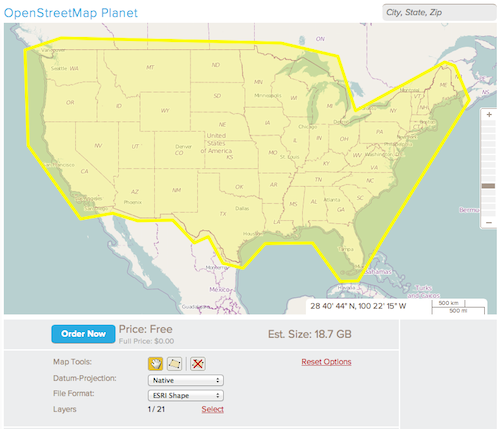 We’ve got the whole OSM world up on our market and I can clip out the USA, request only the highway data and deliver as a shapefile in a matter of minutes. It’s that simple to get the OSM road network at as shapefile. Plus you can use it how you see fit, as long as you credit back the project. Hey, Merry Christmas Devils Dream!